It’s Here! 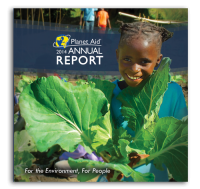 Our 2014 Annual Report - Planet Aid, Inc. Planet Aid has released its 2014 Annual Report, which details the successes of our environmental and development initiatives over the course of 2014. Planet Aid recycled more than 100 million pounds of textiles and funded development projects in 12 countries that have reached approximately 2 million people. Some of the highlighted programs include Food for Knowledge in Mozambique, capacity building in the Democratic Republic of Congo, water drilling in Malawi, and microfinance in India. We also include a few highlights from our U.S. partnership initiatives. Read the 2014 Planet Aid Annual Report below, and click here to see past editions.